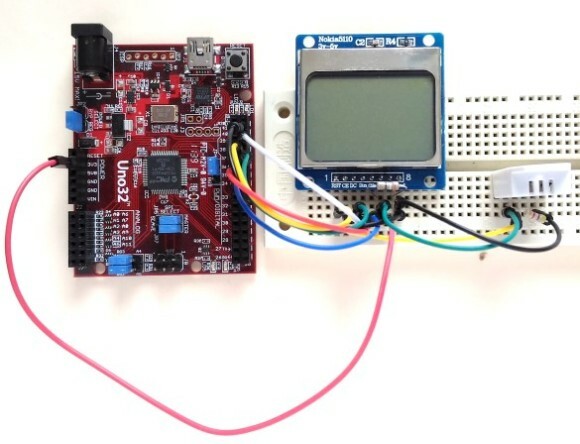 In Tutorial 4, we learnt interfacing an HD44780-based LCD to a chipKIT board for displaying alphanumeric output. 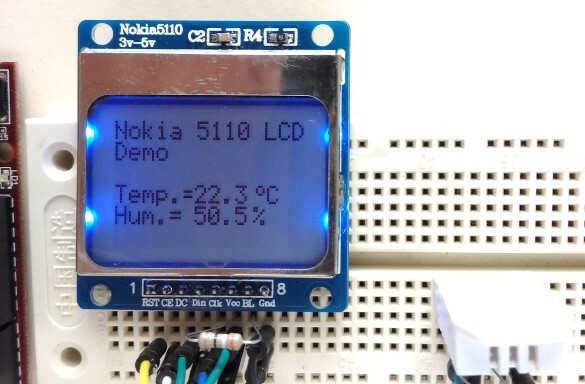 Today, we will see how to connect a NOKIA 5110 graphical LCD (used in Nokia 5110 cell phones), which is a 84×48 pixel monochrome display of about 1.5″ diagonal in size. The display can be used for graphics, text, and bitmaps. We will also connect a DHT22 temperature and humidity sensor to the chipKIT Uno32 to add more fun to our experiment. DHT22 is a low-cost temperature and humidity sensor that provides calibrated digital outputs through a single wire digital interface. The following figure shows the pin diagrams of the DHT22 sensor. 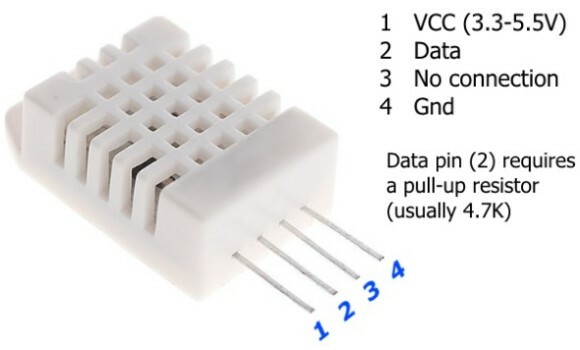 A pull-up resistor (usually 4.7K) must be connected between the Data and VCC pins. 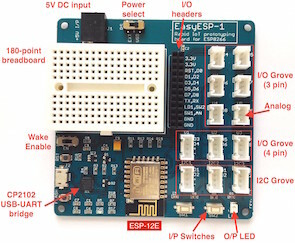 In our experiment, the sensor data pin is connected to pin 7 of chipKIT Uno32, while the sensor is powered through the 3.3V supply pin on the chipKIT Uno32 board. The complete setup of this experiment is shown below. We will need to install two libraries for developing the firmware for this experiment. 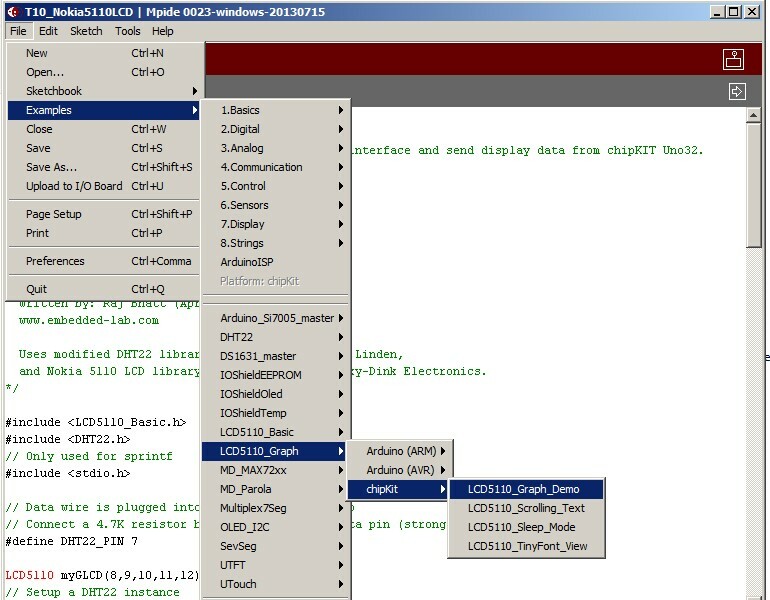 The first library required is the standard Arduino DHT22 library, which is modified by Trevor van der Linden to make it work with chipKIT platform. The second one is Nokia 5110 LCD library for chipKIT from Rinky-Dink Electronics. There are two versions of the LCD libraries: LCD5110_Basic, which supports texts, and LCD5110_Graph, which supports text, graph, and bitmaps. Download and install these libraries to your mpide/libraries/ folder using the following download links. After uploading the chipKIT firmware, the temperature and humidity measurements are displayed on the LCD screen as shown below. The values are refreshed every 5 seconds. 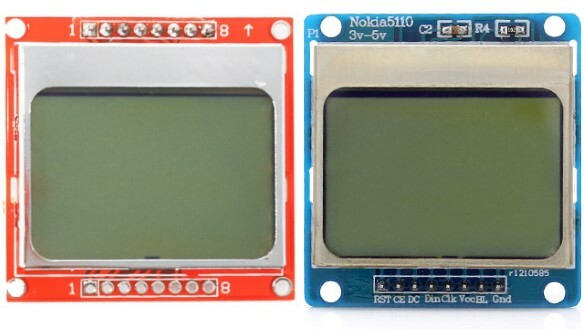 I would highly recommend to test and run these examples to get more familiar with the LCD5110 libraries. 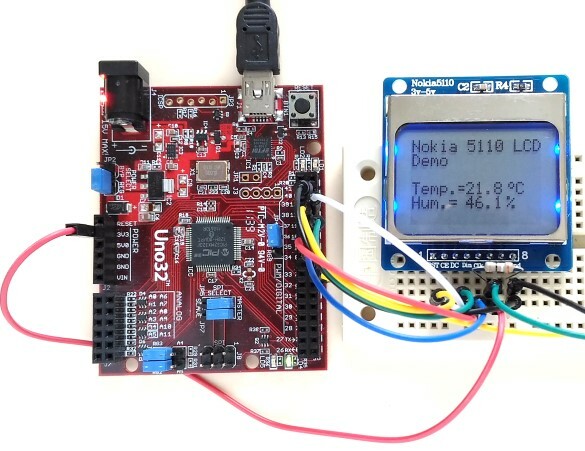 Simply upload these examples one by one to the Uno32 board without making any changes to the current circuit setup and see the action on the LCD screen.